From its opening performance by the Berlin Philharmonic in August 1998, the KKL Luzern Concert Hall was recognized as one of the world’s great performance centers. An international landmark, both architecturally and culturally, the complex attracts music fans from around the world to its picturesque lakeside setting. 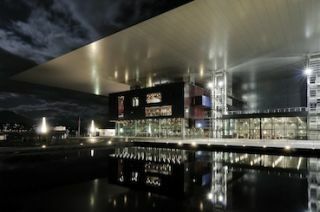 Designed by architect Jean Nouvel and opened in 2000, KKL Luzern is comprised of three distinctive sectors: the conference and meeting room wing, complemented by a number of lounges and restaurants; a black box-style multipurpose hall, which presents events ranging from rock concerts to general assemblies; and, a Concert Hall distinguished by world-class acoustics designed by Russell Johnson’s Artec. The Concert Hall features some remarkable acoustical properties, including an extremely low quietness level of below 20 dB and mechanically variable room acoustics employing huge echo chambers surrounding the hall. A dozen years of constant use—with a yearly booking rate of more than 90 percent—coupled with significant technological advances—prompted the KKL Luzern management group to upgrade its retractable electro acoustical system. WSDG, an international team of acoustics experts, was brought in to accomplish this essential project. The walls are white and many of them in fact are not walls, but touch panel-controlled hydraulic doors that can be used to modify the reverberation time for different applications. The Concert Hall itself has a volume of 17’823 cubic meters (about 630’000 cu. ft), the echo chambers (with doors in the open position) can increase the volume by an additional 6’189 m (220’000 cu. ft) - about 1/3 of the hall’s volume. The echo chambers are treated by varying arrangements of absorbing curtains, providing a variable median reverberation time of between 2.0s and 2.8s. The walls (and/or doors,) are slightly convex and covered with a total of 24’000 custom designed gypsum relief elements. For reinforced events, the reliefs are covered by white curtains. Prior to an event, KKL Luzern’s technical team configures the room based on the parameters received from the conductor and, on their vast experience from past events. Further fine-tuning of the room’s variability is accomplished while rehearsing with a conductor. As technical director Tjark Kuhlmei explained, “We have conductors who know the room very well and want it set up exactly to their personal preferences. For example, Claudio Abbado knows precisely the slight change that can be achieved by varying the canopy height by 20cm to produce a subtle, yet more pronounced harp sound." Dr. Dominik Isler, COO, reports: "The room acoustical quality of the KKL Luzern Concert Hall is on par with other world-class halls, so the main objective for the new sound reinforcement system was that we achieve the same high quality level in electroacoustical concerts as we do in classical events." In addition to extremely high quality acoustic requirements, further parameters had to be met. These include the ability to fully retract the loudspeaker system for non-reinforced events; eliminating the need for temporary placement of auxiliary loudspeakers for audience coverage; 360-degree coverage for spoken word events (also covering the area besides and behind the stage, including the balcony below the organ) and, a more accurate perception of directionality. Due to the complexity and logistics of the project, WSDG was mandated for a two-year project covering the consulting, planning, contractor selection, supervision of installation and calibration of the technical systems. “A major issue of this hall is the wide distribution of seats on five vertical levels surrounding three of the four walls, and consequently, the coverage requirements of the electroacoustical sound system," said Dirk Noy, general manager of WSDG’s Europe Office. "The WSDG solution’s core idea was the realization that the KKL Luzern Concert Hall is mainly designed for acoustical sources that are placed directly on stage.” Consequently, the new main loudspeaker system is installed significantly lower and closer to the stage than the previously installed solution. The main system is supplemented by a distributed system whose elements are permanently installed but retractable by motors. The project was divided into three phases: firstly the identification of the requirements, system planning and preparation of specifications, secondly the on-site evaluation of a total of three loudspeaker system candidates, and lastly the execution phase of installation planning, supervision and commissioning. The preparation and specification in phase 1 and the on-site evaluation in phase 2 determined that d&b loudspeakers provided the optimum system both in the technical evaluation (acoustical measurements) as well as in the listening tests (consisting of questionnaires within a test audience of 20 persons with varying backgrounds). The procuring and installation assignment was awarded to auviso, one of Switzerland’s most significant system integrators, based in Lucerne. The new sound reinforcement system consists of the Left Right main system with two line arrays of eight d&b V12 units each, suspended above the stage front edge, two additional line arrays for covering each of the balconies with five d&b V12 units, a stage edge in-fill system consisting of two d&b V-Sub and two d&b V12 units each on the right and left and a stage mounted front-fill provided by six d&b E6 units. For events requiring a 360-degree speech reproduction, a retractable center cluster was provided with a front section (consisting of eleven d&b T10 units) and a rear section (consisting of three RCF VSA 2050 digitally controlled column loudspeakers). The d&b V12 units have a nominal horizontal dispersion of 120-degrees; the vertical tilting is variable from 0 to 14 degrees. The passive 3-way units are equipped with two 10-inch low frequency drivers; a horn loaded 8-inch midrange driver and two 1.4-inch high frequency drivers mounted on a dedicated waveguide. The d&b V-Sub units hold a forward radiating 18-inch driver in a bass reflex enclosure and a rear-firing 12-inch driver in a two-chamber band pass enclosure. With this arrangement and the algorithms within the D12 amplifier a Cardioid dispersion characteristics with a significant attenuation of the energy radiation towards the stage can be achieved. Amplification is provided by d&b D12 units that allow for precise tailoring to the installation parameters. "Beyond their sonic qualities we also really like the aesthetics of the new system, being an inconspicuous, slim line array," Tjark Kuhlmei points out, "With the subs on stage, we can flexibly adjust the low frequency reproduction as required, or not use them at all, for example for pure speech events.” Signal transport from the Yamaha DME System DSP (digital signal processor) to the amplifiers is achieved via digital AES / EBU at a 96kHz sample rate.